1 of 1 Heat oven to 350 degrees . Line bottoms of three 8-inch round cake pans with wax paper. Coat with nonstick cooking spray. 1 of 1 Prepare cake mix according to package directions, substituting buttermilk for water. Divide batter evenly among prepared pans and smooth tops. Bake at 350 degrees until firm and a toothpick inserted in center comes out clean, 17 to 20 minutes. Transfer pans to a wire rack and let cool 10 minutes. Invert and let cool completely. 1 of 6 Chop remaining 4 oz white chocolate. Microwave 1 minute, stirring frequently until smooth; set aside to cool slightly. 2 of 6 Beat cream cheese and butter in a large bowl until fluffy. Gradually add cooled chocolate, beating until smooth, making sure to scrape down sides of bowl. Add powdered sugar, vanilla and peppermint extract. Beat until smooth. Increase speed to high and beat frosting until light and fluffy, about 3 minutes. 3 of 6 With a serrated knife, trim tops of cake layers to make even. Place one cake layer on a serving platter, trimmed side up. Spread a generous cup of frosting over top. Place another cake layer on top of frosting, trimmed side down, gently pressing into frosting to make level. Spread a generous cup of frosting over top. Place remaining cake layer on top of frosting, trimmed side down, pressing into frosting to make level. Spread a thin crumb coating of frosting all over cake. Place cake in freezer for 15 minutes to set. 4 of 6 Meanwhile, whip heavy cream until fluffy and smooth. Fold into remaining frosting. Place Peppermint Plate on a flat serving platter. 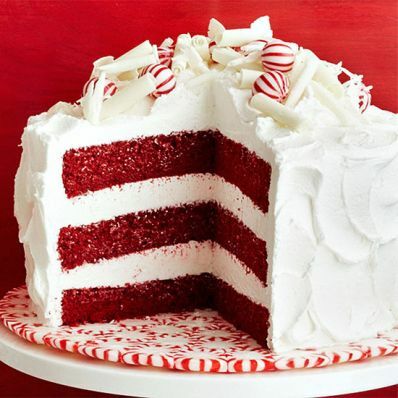 Transfer chilled cake to Peppermint Plate. Spread frosting over cake, making soft swirls with the tip of an offset spatula or a small spoon. 5 of 6 Line a cookie sheet with wax paper. Remove chocolate block from loaf pan; peel away plastic. Holding chocolate with a piece of paper towel to prevent melting, make curls using a vegetable peeler. Place curls on prepared pan. If chocolate or curls become too soft, return chocolate to refrigerator. 6 of 6 Decorate top of cake with curls and peppermint candies.